Great news for Starbucks lovers! 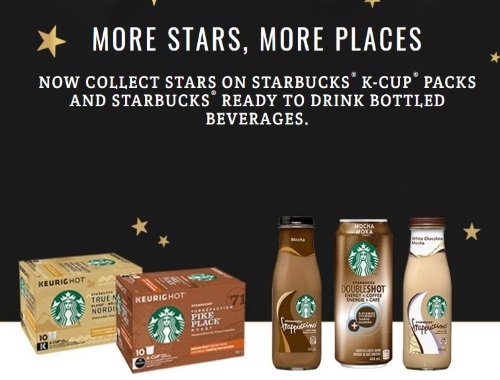 You can now collect stars on your Starbucks Rewards Card when you buy Starbucks K-Cup packs and Starbucks Ready to drink bottled beverages at grocery stores! STEP 1: SHOP- Shop for your favourite qualifying Starbucks K-Cup Packs or Ready to Drink products. STEP 2: SIGN IN - Sign in to your Starbucks Rewards account or, if you are new to the program click on the Sign Up Now button to register. STEP 3: EARN - Earn Stars when you upload the receipt for your purchase of qualifying products. You have 60 days from the purchase date to submit your receipt. Stars will be applied to your account approximately three days after confirmation of a successful receipt submission. View list of participating products here.